Polaroid made the tech-world wondering. Out of nowhere, they showed their new smart camera SC1630 running Android OS. It has a real 36-108mm lens, and 16 Megapixel resolution. A 3.2 inch screen and WiFi-capabilities makes this a real Android device. Don't be mistaken, it's a real camera. Point and shoot style. There is a lot of skepticism about if the camera will be better than other smartphones. Of course. Even with a mediocre sensor, the real 3x zoom lens will get better results than any smartphone without. Plus the 16MP sounds tempting enough. Sometime in 2012 we will get our hands on it. Sounds like a thing, many have waited for. 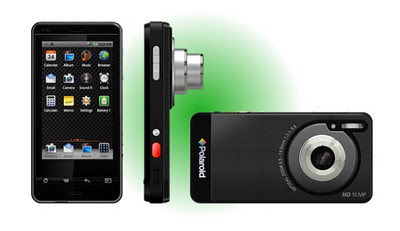 LAS VEGAS, Jan. 10, 2012 /PRNewswire/ -- Polaroid today announced that capturing and sharing high-end digital images is now seamless with the Polaroid SC1630, an Android powered smart camera. The Polaroid SC1630 Smart Camera features a high definition 16 megapixel camera with built in 3X optical zoom, touch screen display and Wi-Fi, making uploads to social networks as easy as the touch of a button. Merging the optics of a digital still and video camera with the limitless power of the Android platform, the Polaroid SC1630 Smart Camera evolves the process of clicking, editing, uploading and tagging to an instant experience on one device. Capture Like the Pros: Life's quickest moments are no longer at risk to becoming blurry images from a basic camera phone. Built on a 16 megapixel CCD senor, the Polaroid SC1630 Smart Camera treats images to a 3X optical zoom – a feature not found in most mobile phones. Choose from 18 scene modes and then click and view crystal clear images – captured at 36mm or full 108mm magnification – on the Polaroid SC1630 Smart Camera's 3.2'' widescreen display. Instantly Connect to the World: The Polaroid SC1630 Smart Camera's Wi-Fi, Bluetooth, and optional cellular data connections empower digital images to be shared from anywhere in a snap. Get Productive: Need to check-in on where friends are gathering, get directions or make the next move in your favorite game? Backed by the power of Android, the Polaroid SC1630 Smart Camera supports Google's Android Market, making it truly like no other camera available today. Now you can snap, share and link up with more than 400,000 apps. "Polaroid has helped the world bring stories to life through photographs for the past 75 years," said Scott W. Hardy, President, Polaroid. "The newest member of the Polaroid family, the Polaroid SC1630 Smart Camera unites the beauty of high-end digital images with powerful Android connectivity features. The result is an instant experience of click, capture and share that enables social networks to see and experience the moment as if they were there." The Polaroid SC1630 Smart Camera powered by Android can be viewed at the Consumer Electronics Show (CES) in the Las Vegas Convention Center's Central Hall (booth #13613) from January 10 - 13, 2012. High-res images of the Polaroid SC1630 Smart Camera can be found at http://www.tradeshownews.com/events/2012-International-CES/Polaroid/ .